Pick a random person out of the phone book, and there’s a better chance he or she will get struck by lightning than commit voter fraud. That didn’t stop President Trump from launching a commission on “election integrity” on Thursday. It’s only the latest Trump move that casts doubt on the trustworthiness of the U.S. electoral system. But here’s the good news: There’s no sign, yet, that Americans’ faith in U.S. elections has been diminished. There is some bad news, too, but I’ll get to that a moment. Just before the 2016 election, in the midst of all that “the system is rigged” talk, most Americans still had at least some faith in that system. 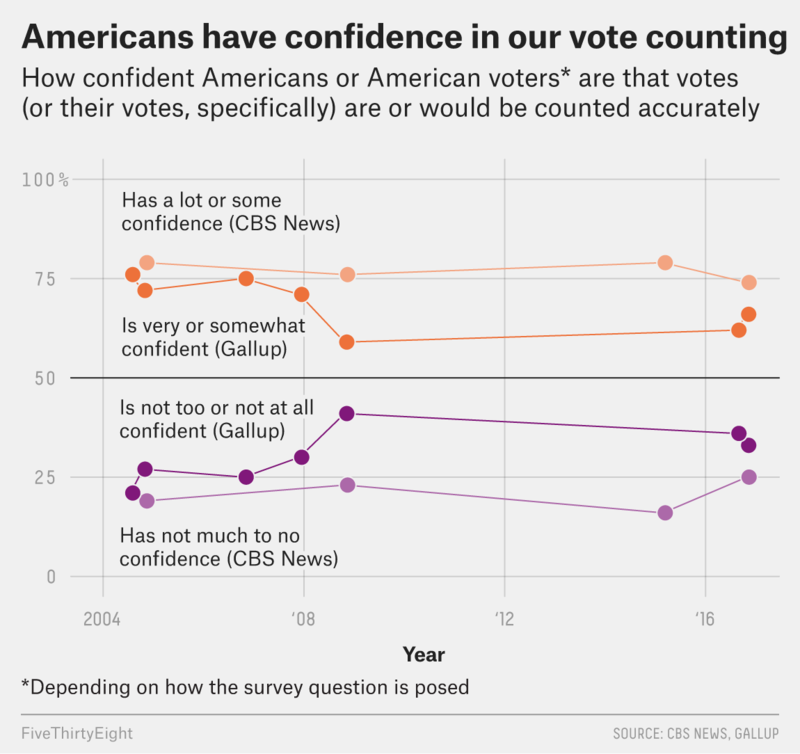 A Gallup poll taken in the month before the election found that 66 percent of Americans were “somewhat confident” or “very confident” that the votes cast in the 2016 election would be counted fairly. A CBS News survey, also conducted mostly in late October, showed that 74 percent of voters had some or a lot of confidence that the votes would be counted properly. A significantly smaller 25 percent had not much to no confidence. Indeed, I couldn’t find any poll in the Roper Center polling archive showing that more than a majority had little to no faith in the U.S. vote-counting process. It’s possible that Trump supporters thought their candidate was going to lose and wanted to preemptively excuse the result by questioning the process. But if that were the case then we’d have expected more Republicans to not trust the vote in 2008, too, when polls clearly showed Barack Obama defeating John McCain. Yet in that election, Democrats and Republicans had roughly equal faith that the votes would be counted fairly. But then do nearly 4-in-10 GOP voters truly believe the system is rigged? Perhaps. Oftentimes, however, voters voice “symbolic beliefs” — support for a particular claim simply because it’s become associated with their partisan team. Many Republicans might have said they thought Obama was a Muslim, for example, not because they actually believed it, but simply as a way to voice disapproval for Obama. Same for the many Democrats who said they thought George W. Bush knew about the Sept. 11 terror attacks in advance. Some Republican voters might be telling pollsters that U.S. elections are rigged simply because that’s the “pro-Trump” answer. Of course, even if that’s the case, the politicization of election administration is a worrying development. Democracy depends on everyone trusting that our elections are accurate and fair. Perhaps Trump’s commission will restore GOP faith in the U.S. electoral system and convince more people that it’s sound. But the commission’s mere existence implies that it isn’t. That’s false. As far back as I could find polling on this question. GOP-identifying voters made up about 31 percent of the electorate in that survey, so while the share of Republicans who trust the vote dropped by more than 25 percentage points, that drop only affects the topline numbers by a few points.